I hope that you all are in the midst of enjoying your weekend! 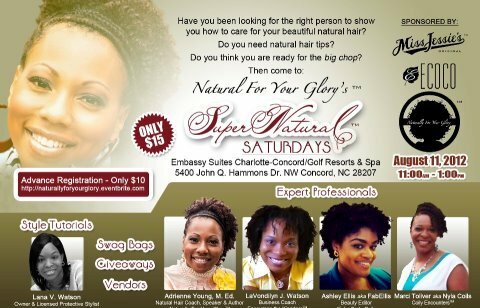 If you follow me on Facebook or Twitter, I am sure you have heard me promoting the Naturally For Your Glory Meetup taking place next Saturday, August 11th, in Corcord, NC. This two hour event is being held from 11 a.m. - 1 p.m. at the Embassy Suites Concord-Charlotte. It will include giveaways, tutorials, questions and answers, beauty advice and more! Tickets are only $10! To purchase tickets, click here. Also, there is an opportunity for you all the WIN free tickets to the event. To find out how, check out the video below. P.S. I will be there too! Thanks for reading, God bless, and stay fabellis!